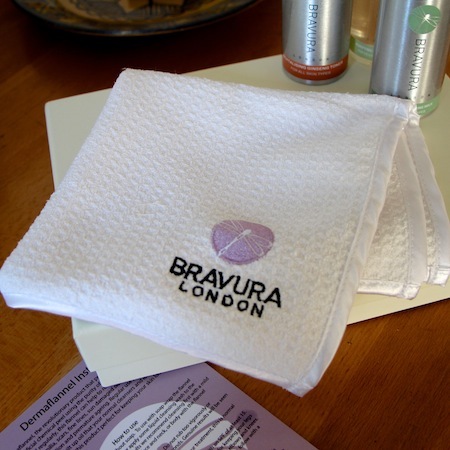 I was sceptical about Bravura’s Dermaflannel. The “revolutionary product that provides you with the results of superficial chemical peel using the purity of water” looked like nothing more than a bobbly washcloth with a pretty logo sewn on at the corner. It was a big claim to make about so simple a product and I was fully prepared to banish the cloth to the Bin of No Return*, but somehow it made its way into my travel bag and ended up making an appearance one blurry, hungover morning when I was on a hen-do. As I unrolled the flannel I scoffed a little at the warnings that peppered the instruction leaflet – do not rub too vigorously…do not use the flannel for 48 hours before or after any acid treatment…do not use the flannel on broken capillaries… Just how exfoliating could a flannel be? I couldn’t imagine that a textured cloth could do anything significant enough to the skin to warrant so many cautions, but there they were, one after the other; do not use if you’re undergoing laser treatement…don’t sunbathe after your treatment without using a sunscreen…and my favourite: the flannel may appear to be harmless but it’s quite abrasive. And so cynical old Ruth bulldozed straight on in with the Bravura Dermaflannel and used it to remove her cleansing balm (Clinique’s Take the Day Off), wiping it across her face with “firm, short strokes and not a circular motion” as instructed. And nothing seemed to really happen. I had been expecting some kind of tingling sensation or the kind of warmth that you get when you use a facial scrub, but the cloth felt comfortable against my skin and not at all abrasive. It wasn’t until I finished removing all of the cleanser and touched my skin with my fingertips that I realised quite how efficient the Dermaflannel had been at polishing my face. It was absolutely smooth and soft and looked as though I’d had a quick, no-nonsense facial. Slightly pink, a little glowy and a million miles away from the grey death mask I had been wearing just minutes before. Impressive – and the Dermaflannel continued to impress with subsequent uses. Smooth, fresh-looking skin from a tool that I didn’t really have to give a second thought to – I just swapped it with my usual flannel. If you’re a low-maintenance person, this will appeal: there’s no extra step to your skincare routine, no additional bottles of product to squeeze onto the bathroom shelf. Those who like to keep things simple – the fewer ingredients the better – will, I think, find this a pleasing way to exfoliate. There’s no real magic secret with this cloth; it just has a very clever weave that effectively sloughs away dead skin cells and whatever other crud is on the surface of your face, making way for fresh and shiny new skin cells. As with any efficient scrub, peel or abrasive treatment, any products you apply afterwards feel as though they are performing that bit better. I often find that I need to use less product, too, on well-prepped skin. You can use the cloth with or without cleanser (I like the “slip” that you get with a cleanser, using just water feels a bit squeaky) and you can also exfoliate your body with it. Which sounds obvious, but it hadn’t occurred to me and I have yet to give it a whirl on my knees and elbows and scaly shins! I now use the Dermaflannel a couple of times a week and I really think that I’d miss it if I stopped. I tend to be very gentle with my skin afterwards (I don’t follow up with any kind of peel or acid, including Liquid Gold) and I make sure that I’m adequately protected from the sunlight, if I’m ever lucky enough to be exposed to any! A note: if you have sensitive or thinned skin then be extra careful – use the cloth with a very light hand and perhaps only use it once a week. Don’t be tempted to keep going over the same areas or make the mistake of thinking that the cloth isn’t working – I overdid it once and it was a little bit like having a touch of sunburn! A nifty little thing, then, this Dermaflannel. Great for people who feel as though their skin is dull or congested and spot-prone and who simply don’t know where to start with choosing the right skincare treatments. 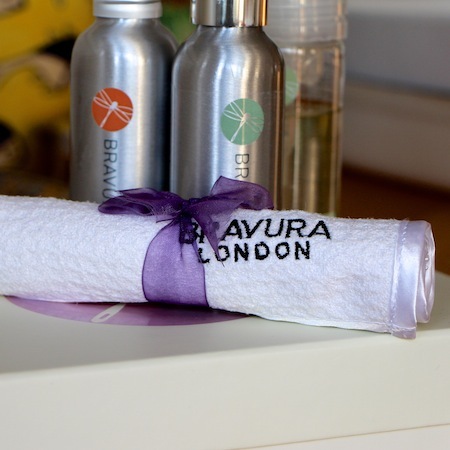 Bravura say that this flannel can help to reduce “acne, spots, blackheads, whiteheads, milia, scars, fine lines, sun damaged skin, age spots, dry skin, hyperpigmentation and premature ageing” and though I don’t see it as a replacement for dedicated skincare treatment products, it’s a brilliant, easy addition to the cleansing ritual. I don’t think that the flannel ever “runs out” (don’t wash it in the machine, just rinse and use antibacterial soap) which makes it exceptional value for money. Expensive for a facecloth, but cheap for the exfoliator that never stops giving!